This slushy morning my dog and I braved the elements and found a beacon of Sunday morning warmth and ritual on our walk – the doughnut shop. With powdered sugar on my lips, I bit into the pastry and caused the jelly filling to shoot out the back, leaving me with a gooey mess. Being me, a therapist who sees anatomy everywhere she looks, this reminded me of a disc injury in the back. 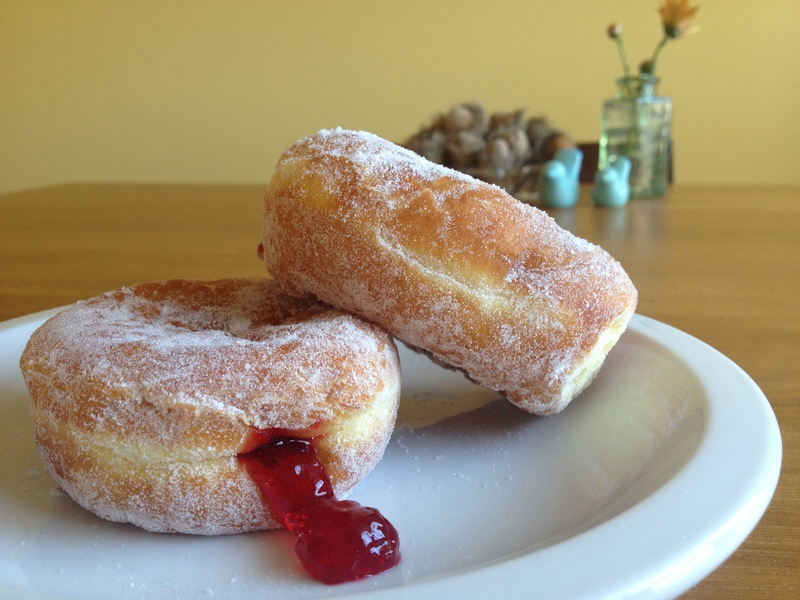 The jelly filled doughnut is a great analogy for a spinal disc. Spinal discs are puck-shaped shock absorbers sandwiched between every vertebrae of the spine. The vertebrae protect the spinal column and allow spine motion between each segment. Each vertebra has a pair of nerves that exit the spinal column next to the disc to innervate a specific region of the body. Discs are made of tough rings of cartilage, called the annulus fibrosus, which look like a cross-section of a tree. Their layered circular fibers resist compression in all directions. Discs have a squishy middle, called the nucleus pulposus, which absorbs forces put on the spine. This is the jelly center of the doughnut. If too big a force or a constant force is applied, the nucleus pulposus can push into the annulus fibrosus and damage it, much like a big bite into a doughnut causes the filling to escape. Disc Herniation – This is where the nucleus pulposus tears through the annulus fibrosus and escapes the disc; the jelly filling has exploded out of the pastry. Pain and numbness are caused by the torn disc or extruded nucleus pulposus pressing on the nerve nearby as it exits the vertebrae. The body will absorb the nucleus and the torn disc often will mend over time. 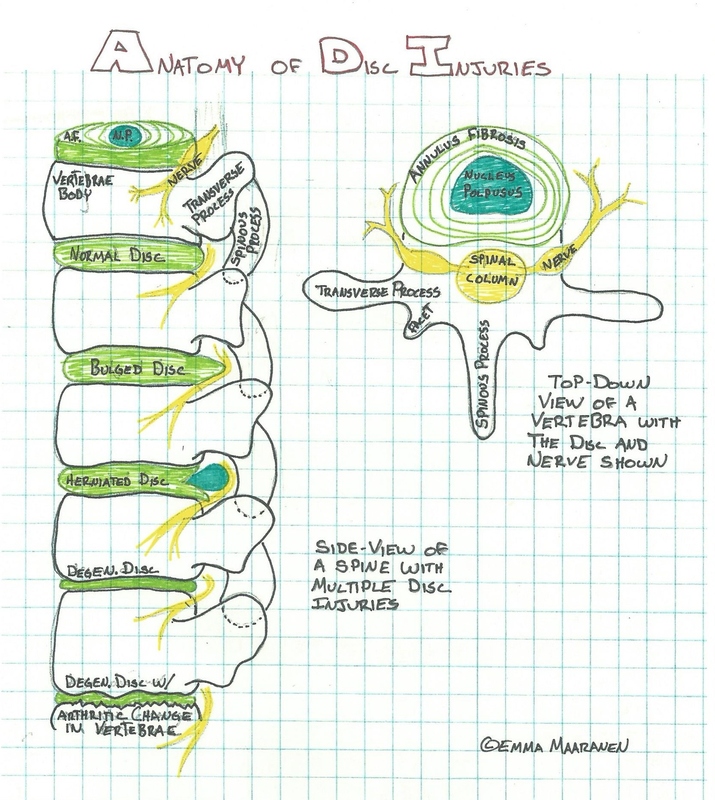 If the disc continues to irritate the neighboring nerve, surgical intervention may be required. However, the nucleus is gone and can never return to the middle of the disc. This disc will not be able to resist compression in the same fashion in the future, and care (a strong core and good biomechanics) will be needed to keep the disc healthy in the future. Bulging Disc – In this case, the nucleus pulposus is being squished on one side and is pressing on the opposite side of the rings; the jelly is oozing into the pastry and with a little more force may burst out. The nucleus pulposus is tearing the inner rings and expanding the disc. This disc bulge can put pressure on the nerve causing pain and numbness. By removing the pressure on the disc the nucleus can reabsorb into the middle of the disc and the tears in the disc can repair. A bulged disc is quite delicate and too much force on the injured disc can cause it to herniate. Degenerated Disc – Long-term pressure or a history of trauma to the disc can cause the nucleus pulposus to disintegrate and/or the annulus fibrosus may flatten; your doughnut is drying out and the jelly filling is turning to a dense paste. The disc is no longer able to cushion compression in the spine as it used to. Pain will generally come from the muscles trying to protect the spine in that location or from the spinal joints (facets) smashing together now that the flattened disk has reduced the space between the affected vertebrae. Disc degeneration is often accompanied with arthritis of the spine in that area. You may hear people referring to their disc injury as slipped, ruptured, compressed or prolapsed. These terms loosely refer to a bulged or herniated disc. If you have injured your back, there are several things to consider on how to proceed. It the pain is sudden and is accompanied with numbness down the arm or leg, especially if numbness is present in both limbs, you need to go to the ER! If pain comes on gradually and is accompanied by numbness down the arm or leg you should see a physician. If any pain in your back continues or worsens over three days you should see a physician. Once your doctor has diagnosed your disc injury a plan to heal it can be made. Surgery is rarely performed on new disc injuries unless there is damage to the vertebrae above and below the disc (such as a displaced fracture) or the spinal column is compromised and paralysis is a concern. Disc injuries typically heal with therapy, anti-inflammatory medication and time (six months to two years). Therapy for disc injuries involves changing postural habits such as sitting at a desk and lifting mechanics. Muscle imbalances will be addressed and joints will be mobilized to restore normal range of motion. A physical therapist that specializes in spine injuries (we know a few fantastic ones we can recommend) is critical to healing a disc. Massage therapy will address muscle tension at the injury site and can help with nerve generated pain down limbs. Acupuncture reduces nerve pain in many people. Healing from disc injuries is a slow process. As an athlete it is important to have a team of professionals guiding you in return-to-play parameters and to be creative and open to new activities (like swimming or Pilates) to keep you active while supporting the healing process. When a disc has healed it is important to continue thoughtful training and biomechanics forever! Honestly, anyone who would like to reduce their chances of disc injuries should do this. Discs are the most vulnerable when the spine is in flexion (forward folding) and a twisting action is done; such as sitting in a slouched position and twisting the legs to the side to get up from a workstation. This is made more tenuous by adding a heavy object into the equation; such as bending over at the waist to pick up a backpack and twisting while straightening the spine. It has been said over and over, but it is true – a strong core will support the spine and make it more resilient! There are many methods to do this: Pilates, specific weight training programs, personal training, home videos, kettle bell, etc. I’ve even seen a “spin your core strong” class advertised! Find something you enjoy and add it to your weekly routine. Even two minutes of targeted dynamic core strengthen exercises as part of a warm-up routine will yield excellent results. With a strong core, you may even indulge in a doughnut now and then. This entry was posted in disc, injury prevention, lower back, Physiology, spine, Sports Injuries and tagged bulged disc, compressed disc, disc injury, herniation by focusbodywork. Bookmark the permalink.